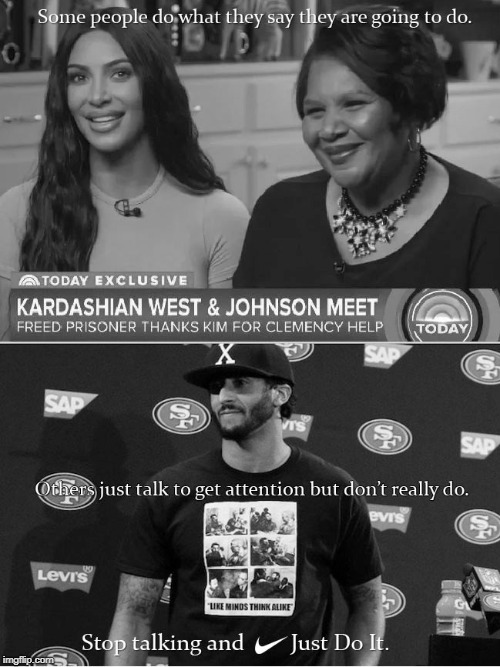 Colin Kaepernick is an idiot. Stop trying to get attention and actually do something. I have said from day one that all these players (and others) should put their money where their mouth is and go to DC on their time off and kneel in front of the DOJ (where it belongs). Can you imagine the amazing impact and photo-op it would have if there was a sea of protesters kneeling in front of the DOJ???? Or better yet...put your EGO aside and go sit down with Trump too. Rand Paul (whom I call the Trump Whisperer) has been fighting for much needed Criminal Justice Reform for YEARS. Have a meeting with him and actually accomplish something!